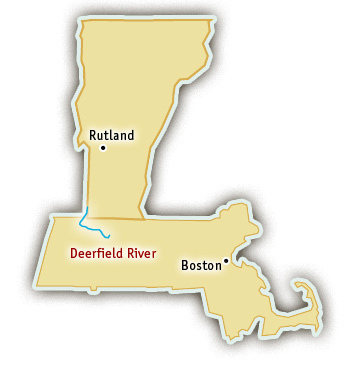 The Deerfield River originates in the Berkshire Mountains of Vermont and flows south into Massachusetts. Deerfield River rafting is available on two sections. The Zoar Gap run is perfect for beginners with Class II-III rapids while the Dryway is a more challenging Class IV section. This river is dam controlled and each section has a set schedule of release dates. 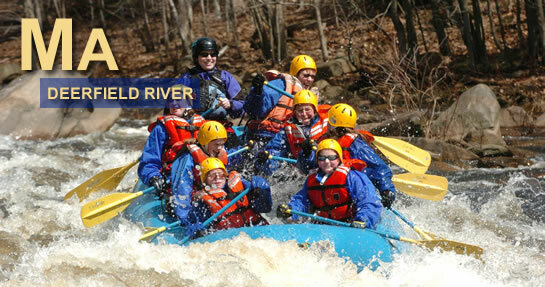 Visit their website for more information about Deerfield River Rafting. The Zoar Gap run is the perfect rafting trip for beginners and larger groups. This section of river provides fun Class II and III rapids in a spectacular wilderness canyon. The Zoar Gap section is ten miles in length and starts off with some warm up rapids like Microwave, Freight Train and Pinball. In Zoar Gap, the canyon narrows into a technical boulder garden. Once you have completed the Zoar Gap, there are plenty of opportunities to jump into the water and float past the forested shoreline. The history of this stretch is closely linked to the development of the railroad and hydropower. Environmentally, this section is important for the variety of bird species including red tail hawks, ospreys, bald eagles, and blue herons, its active beavers, and its potential as a trout fishery. The Dryway section of the Deerfield River offers challenging rapids in a remote setting. The rugged northern Berkshire Mountains provide the backdrop for this exceptional stretch of river. The Dryway run is about 3.5 miles long with Class III-IV rapids the whole way. From Factory Rapid past the Dunbar Brook Rapid to Labyrinth, the Class IV whitewater keeps your adrenaline flowing. The Deerfield River is dam-controlled, so it is only raftable on scheduled dates when around 1000 cfs (cubic feet per second) is released from the dam. The Zoar Gap run is the most popular section of the Deerfield because it has the most reliable water, with more than one-hundred release days in the spring and summer. The Dryway Section has thirty-two release dates between May and October.